I was not excited to read this book. It was pressed upon me by my father, who insisted it was a good book and that I should write about it on my site. It's not that I don't trust my father's judgment, necessarily, it's just that I know his taste in books isn't quite aligned with mine. He likes westerns and history, and by now he's probably read just about every book about bison ever published. I don't have anything against bison, per se, but I'm not on fire to read about them either. The copy my dad gave me, which I couldn't find a way to politely refuse, actually belongs to my grandfather. He received the book as a gift and read it himself before passing it along to my parents. He left the following review on an orange Post-It note inside the front cover: “A good book albeit a little tiresome in spots.” Not exactly a ringing endorsement. 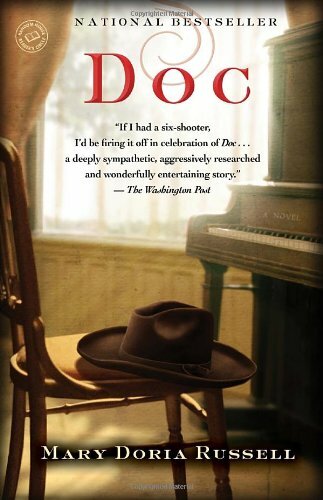 After reading that note and taking in the excruciatingly insipid cover art (a brown brimmed hat resting on a wooden chair in front of a piano), my expectations had bottomed out. I would read the book as fast as I could, try to find some way to write an apologetic, lukewarm recommendation of it, and treat the whole unpleasant experience like removing a Band-Aid—just rip it off as quickly as possible so as not to belabor the pain. You know where this is going, right? The book was awesome, I loved it, my dad was right, and I was an arrogant jerk for doubting him. I flew through the pages, not because I wanted to move on to better books, but because I was enthralled by the story. Historical fiction can be a tough sell for people who haven't tried it before. History equals boring in many minds—we think of it as something we happily left behind in high school. But well-done historical novels are just as interesting, if not more so, than entirely made-up stories. There's something compelling about knowing the characters weren't just characters—they were real people, and this is how their lives played out. Somehow, in historical fiction, the stakes are higher. Russell is a smooth writer, and she evokes Dodge City and its rowdy inhabitants expertly. It was a town of complicated politics, transient cattle herders, brothels and saloons. Russell doesn't romanticize the wild west; she allows it to be the gritty, dangerous place it really was. She's also surprisingly witty. I wasn't expecting many laughs in a book about a prairie dentist, but Russell's Holliday is a smooth operator with an occasionally sharp tongue, and he answers Kate's constant vitriol with snappy one-liners and colorful reproaches. Doc's droll humor is a real highlight. The moral of story here, kids, is that you should listen to your parents. Sometimes they actually do know what they're talking about. Can't get enough Westerns? Check out my recommendation for Kathleen Kent's fabulous book The Outcasts.